Our goal is to develop artifacts that are similar to those found in safety critical systems. Dronology is unique in this respect. It is an open-source system, which normally would be developed using light-weight requirements processes based on feature requests and bug reports; however, given the driving goal of the project -- to create a shared community research environment - we are going far above and beyond the normal practices of an open source system and are working to deliver artifacts at levels acceptable to DO-178c certification. We are committed to frequent releases of our project artifacts includding requirements, architectural design, executable code, test cases, traceability links, safety assets, and more. We also plan to engineer Dronology as a product line. Dronology will be placed into the open-source domain, but will be committed to follow standard practices associated with typical safety-critical software products. Our first planned full-version release is Spring, 2018. You can check the current status of Dronology through our news page. Our goal is to develop multiple versions of Dronology -- each one including artifacts that are useful to Software and Systems engineering researchers working on topics such as safety assurance. We are currently engaged in the early phases of river search-and-rescue and highway surveillance projects. One overarching concern which pervades both prongs of the Dronology project is safety. 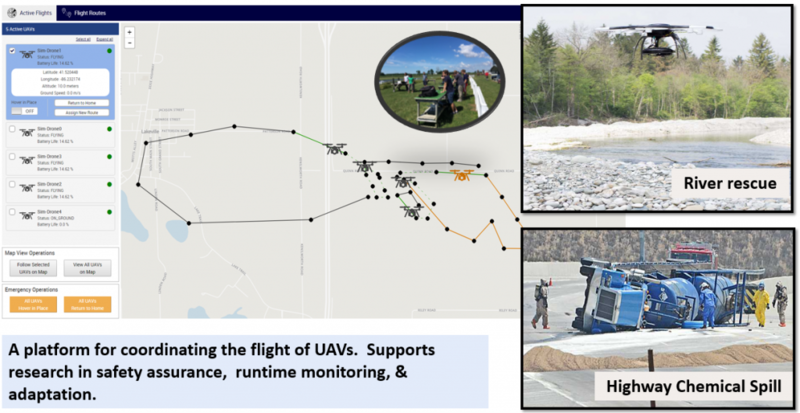 Deploying UAS to perform real-world tasks introduces safety hazards which are systematically working to understand and address.